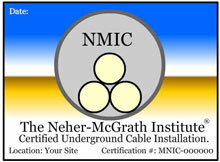 Neher-McGrath Institute - Professional Engineers certify underground electrical system. Neher-McGrath. certification means that your underground installation meets the highest standard and has been designed or peer reviewed by a Registered Professional Engineer (P.E.) who specializes in the Neher-McGrath Calculation. certification tells the end user that there critical environments underground installation are within there temperature parameters and there is minimal I2R energy losses in there underground system. As Critical Environment operators, owners and designers we know there are more than enough things to be concerned about in our buildings. The underground cable need not be one of them. certification increases uptime in your critical invirimment while saving money due to heat losses in your system.